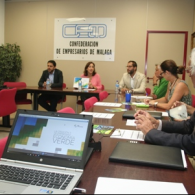 The Spanish coordinator of the European Project "Future Skills and Sustainable Development in the Green Salons" and IES El Palo teacher: Paloma Rodriguez Bonilla, came on the morning of 19 September at the headquarters of the Confederation of Employers of Málaga (CEM) to the training seminar, sponsored by CEA + companies with the collaboration of the CEM itself, on the occasion of the presentation of the report: "Creating companies in the green sector." This study analyzes the environmental field in the European regulatory framework, pinpointing those who offer most likely to grow in the coming years and its characteristics and possibilities: environmental consulting, waste management, renewable energy and energy efficiency, education in environmental information , green marketing and communication, ecotourism, organic farming, environment management, water treatment and purification, transport and sustainable mobility, sustainable construction, and R & D + i environmental and transverse element to all of them. 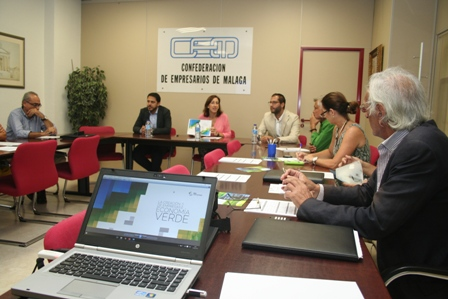 Such Seminar served for participants themselves to disseminate their companies and business plans in the green sector so it was a great opportunity to discuss our European Project Green Salons, resulting pleasantly surprised by the great reception and interest aroused by the Project. All participants agreed that the sector of the Green Salons will be a sector with great potential for the future. Not only because of the cost savings that would cause a more efficient management of energy and natural resources, but also because people are increasingly more aware of the negative effects of chemicals abuse for both health and environment. This customer´s demand is still unsatisfied. As revealed in the course of the day, in recent years Spain, along with other countries of our environment, has become a promoter nation of the Green Economy. However, although significant progress was evident, we still need to deepen our own initiatives in this field, for establishing the appropriate economic, environmental and social structure. Hence the importance of spreading the opportunities offered by the green economy.